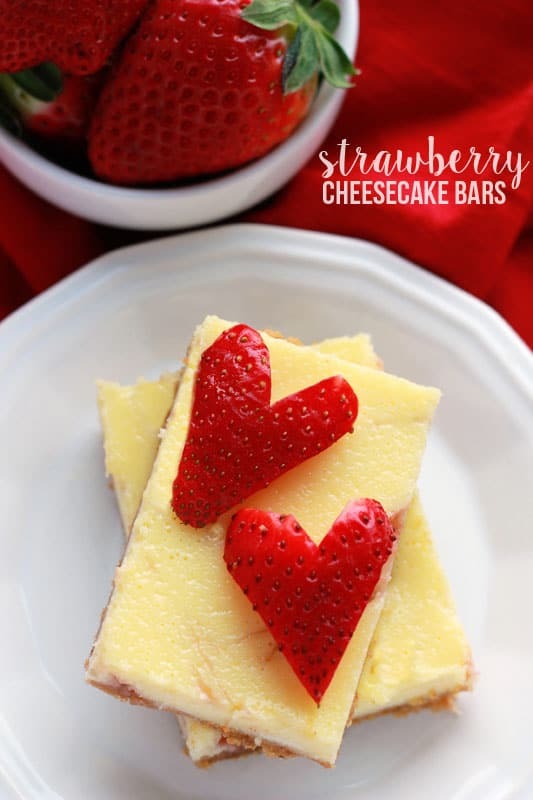 These Strawberry Cheesecake Bars are a sweet way to celebrate any special occasion. You most likely have seen these on my site once or twice. The very first time I gave them a try was for a blueberry cheesecake bar recipe. Those things are seriously dreamy. Even if the photos are only sub par. One day I will make a batch and wait to eat them all until I have taken some updated photos. Maybe. Or maybe I will keep making them and eating them all before I find my camera. Most likely the second option will take over and you will have to deal with the “just ok” images in that post. The SECOND time was when I made the decadent salted caramel cheesecake bars! I do not even think there are words to describe how wonderful they are. You have got the salty twinge of the fleur de sel paired with the sweet caramel and tangy cream cheese filling…. YOU GUYS… I just drooled on my keyboard. Lets pause here for a minute while I search my pantry and hope to find some caramel sauce sitting around…. Ok. Unpause. I was disappointed. No caramel sauce but I did find one lone strawberry cheesecake bar in the fridge. Mission accomplished! I have managed to stuff my mouth full of sugary goodness. I really have been sticking with a red velvet theme for Valentines day this year but wanted to break away for a second and bring you a different red option. 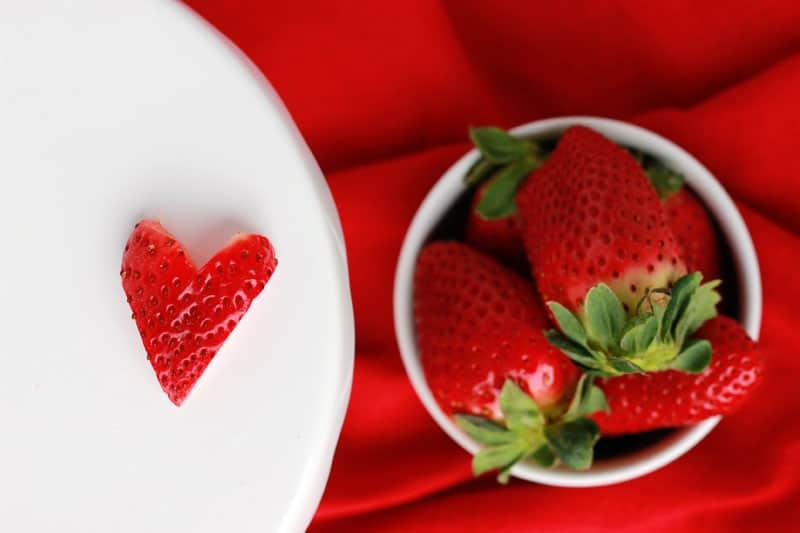 Strawberries are an easy and sweet way to add some festive color to any of your desserts. This recipe takes only 30 minutes to make and leaves you with one of my families favorite treats. Make sure you put this recipe on your list and give it a try. Preheat your oven to 375 degrees. Lightly mist a 9x13 pan with cooking spray. In a small bowl combine the graham cracker crumbs, butter, and flour. Mix with a fork until a crumbly mixture is formed. Firmly press into the bottom of your prepared pan. Bake for 8 minutes and allow to cool completely. Heat your jam in the microwave for 10-20 seconds. Pour over the crust. Cream together your cream cheese and sugar in the bowl of an electric mixer until fluffy. Scrape the sides of the bowl and add the eggs until incorporated. Stir in the milk and vanilla. Pour over the jam. Bake 20 minutes or until the center is set.Top with additional strawberries if desired. This post may contain affiliate links. 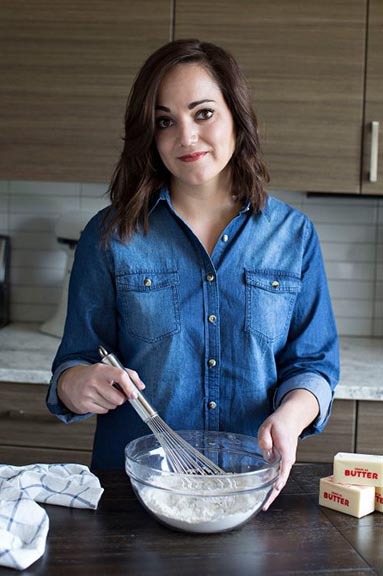 I include these links to help you find specific products that are used in my recipes. If you purchase an item from the link on One Sweet Appetite, I will receive a small commission helping keep my recipes free for you.